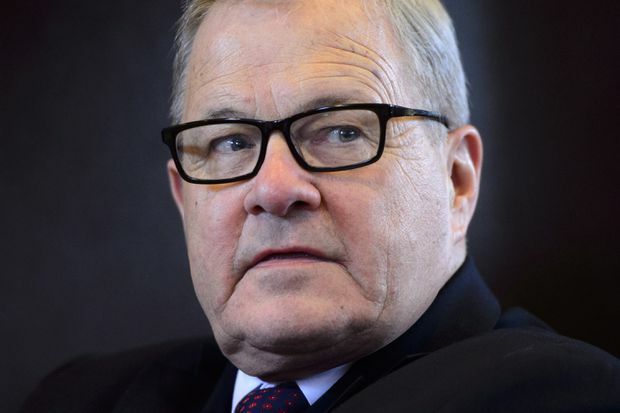 Federal Agriculture Minister Lawrence MacAulay emphasized the importance of the provinces working together as an escalating trade war with the United States puts some farmers on edge. The minister said his provincial and territorial counterparts discussed trade negotiations and the contingency plan during their conference that wrapped up Friday in Vancouver. There’s already a safety net in place through the $3-billion Canadian Agricultural Partnership launched earlier this year to help farmers manage risks and deal with problems, MacAulay said. Lawrence MacAulay, Federal Minister of Agriculture and Agri-Food, at a news conference in Ottawa on Wednesday, June 13, 2018. MacAulay also announced a renewed $55-million AgriRisk Initiatives Program, which he said will help protect farmers against business risks they face. B.C. Agriculture Minister Lana Popham said she was satisfied with the federal plan and said the provinces are united in the context of the trade war. “We stand as one voice, as Canada, in a situation like this,” she said. While U.S. Agriculture Secretary Sonny Perdue has promised that President Donald Trump will restore farmer profitability in that country, he hasn’t specified how and some economists are skeptical that the administration can come up with the billions of dollars necessary to cover losses. Perdue said last month he wasn’t pushing for Canada to do away with its supply management system that controls price and supply of dairy, eggs and chicken, after Trump said he wanted the system dismantled and blasted Canada for charging a 270 per cent tariff on imported dairy products. Ottawa introduced $16.6-billion worth of retaliatory tariffs on some American imports earlier this month in reaction to American tariffs on steel and aluminum. The United States fired back Monday at the Canadian government by launching a formal challenge with the World Trade Organization, at the same time as it filed separate disputes against the European Union, China, Mexico and Turkey over similar counter-tariffs.